Lenovo tablet A8-50 launched :- Lenovo is a Chinese International company headquartered in Beijing, China and United States. It designs, develops, manufactures and sell personal computer, tablets, smartphones, electronic devices and smart televisions. 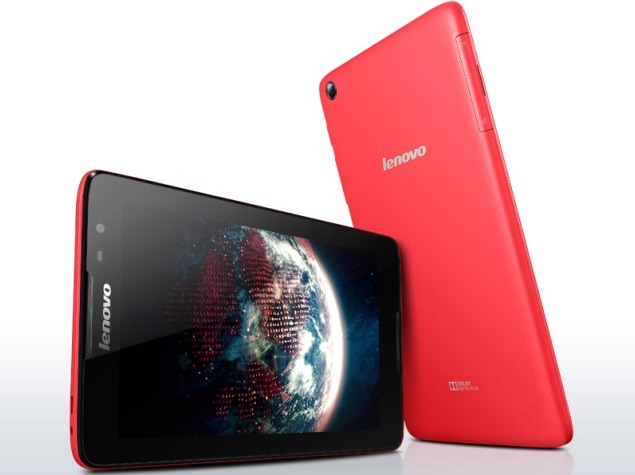 Earlier Lenovo launched the A10 tablet at the price of $250 in United States. The A10 has 10.1 inch display with a resolution of 1200 by 800. its CPU has a 1.3 GHz quad core processor. It has a 1 GB ram. it also includes 5 mp rear camera and a 2 mp front camera. The A10 has a two front speakers enhancement from Dolby. the storage can also be expanded by using a micro SD card slot. it also supports Wi-Fi, Bluetooth. The battery backup of this device is also good with a capacity of 6300 mAH battery, it offers relatively longer battery life. Lenovo called A10 as “Smart Side Bar” that offers easy access to recent apps and shortcut to display controls. It was launched with android version of 4.4.2. Today Lenovo launched its latest voice calling tab A8-50 at a price of Rs. 17,999. this 8-inch tab is now available via company’s online store and online retailers. Battery 4200 mAH will provide you more life which is straight a way equal to more entertainment. The 8 inch Giant screen is surely the best element in it. 16 GB memory seems satisfactory and would make many user happy. Ram 1 GB might not be enough for such a massive tablet. Camera of the Tablet surely need to incremented. Surely looking at the pors and cons of the tablet one can surely make his/her way through and make you mind to buy it or not, Lenovo is counted in one of the great cats that rules the IT world talking about the brand value. Lenovo won’t compromise on that. At the end we wish all the best toÂ Lenovo A8-10 tablet.